Police had to be called on Sunday when about six anti-gay protesters stormed through Calvary Baptist Church in Washington, DC. The protesters eventually made their way to the pulpit carrying signs and chanting slogans. After leaving the sanctuary, Pastor Elijah Zehyoue said that the protesters (who were not members of the church) were “aggressively engaging” members arriving for the 11am service. An why, you ask, were anti-gay protesters disrupting a Baptist church service? 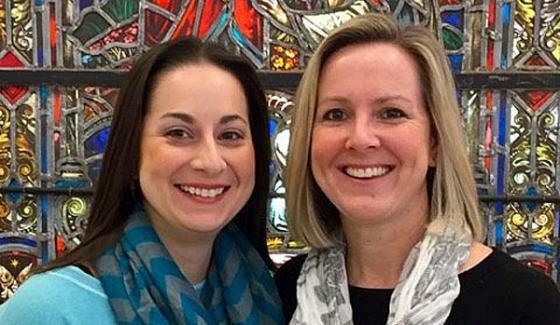 On January 9, the church announced that it was hiring Sally Sarratt and Maria Swearingen as the congregation's new senior ministers. The pair are a married couple from South Carolina. They are currently chaplains in the Greenville area. Sarratt has been serving as associate chaplain for behavioral health in the Greenville Health System and Swearingen as associate chaplain at Furman University. Sarratt has also been filling the role of part-time associate minister at Greenville Unitarian Universalist Fellowship. Sally Sarratt has an MBA. She subsequently earned a Master of Theological Studies degree from Emery. Maria Swearingen earned a Master of Divinity degree from Duke Divinity School. These are important ministerial positions. One of their predecessors was just appointed ambassador to Canada from El Salvador. Another is senior minister at New York's famous Riverside Church on the campus of Columbia University. Calvary Baptist Church was founded in 1862 and is a leading voice for social justice in the nation's capital. According to the protesters we and the entire Calvary congregation are all going to Hell. If that is the case we will have some pretty good company. From my perspective it was gratuitous anti-gay violence and police had to be summoned. Their invective does do harm. They do violence to gay people through the promotion of ignorance. Labels: Anti-Gay Violence, Calvary Baptist Church, Maria Swearingen, Sally Sarratt, Washington D.C.